Once upon a time, there was a old lion in a forest. The old lion was very weak due to age and was unable to hunt any prey for his food. He was thinking about different ways to get food for him. Suddenly an idea clicked. He decided to lie down in the cave pretending to be ill and then who-so-ever will come to inquire about his health, will become his prey that day. This wicked plan of the lion started working. The old lion killed many of his well-wishers and ate them. One day a fox came to visit the old lion. Foxes are normally clever. The fox stood at the mouth of the cave and looked inside. He saw the bones of other animals that were killed. The fox realised that something was wrong. 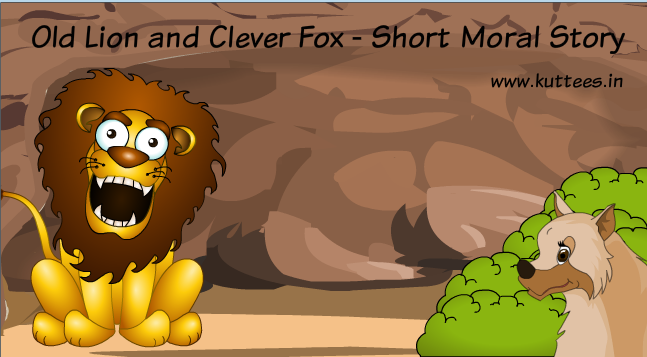 The fox, standing outside the cave shouted, "How are you, sir?". The lion replied, "I am not feeling well. But friend, why don't you come inside?" The fox replied, "I would love to come in. But I could see all foot marks only going inside the cave and none coming out. I am not a fool to come in after seeing them." Saying so, the fox ran into the forest and to alert other animals about the wicked plan of the old lion. After that the poor lion died due to hunger. MORAL : Always be cautious in any situation. There can be one more Moral for this story : If you intend harm to others... You will get harm in return.